On January 30th, 1836, the Birmingham Journal published an enthusiastic report of a dinner held in the Town Hall in the previous week. Although there were many ‘distinguished guests’, the paper declared this had been a ‘truly Birmingham meeting‘ with ‘no false glare thrown about it by any specious show of aristocratical influence or sanction‘. The Hall had been decorated ‘appropriately’ and the galleries were adorned ‘with a galaxy of beauty and fashion’. It was customary at Town Hall dinner meetings for the ladies to sit in the galleries, while the gentlemen drank and feasted in the main hall below. This ‘respectable assemblage’ of gentlemen included Birmingham MPs Thomas Attwood and Joshua Scholefield, along with the Irish MP and ‘Liberator’, Daniel O’Connell. Many toasts were drunk during the course of the evening: ‘to the Mayors of the Liberal Corporations’; ‘to the Spirited and Judicious conduct of the Mayor of Leicester’; ‘to Poland, may England and France speedily vindicate the rights of humanity by the restoration of Poland’. (Polish exiles were among the distinguished guests). Speeches were political and Radical. They called for ‘Justice for Ireland’ and spoke of the great hopes held for the reform of municipal corporations (the 1st Municipal Corporations reform Act having recently been passed). Musical entertainment was provided by the Town Hall organ, played by Mr. Hollins, whose performance ‘and his performance on that noble instrument delighted the company’. He was accompanied by Mr. Pearsall, ‘in excellent voice’ led the singing of ‘Here’s health to all good lasses’ and ‘Roast beef of Old England’ (see video above). The evening, claimed the report, was ‘magical’. 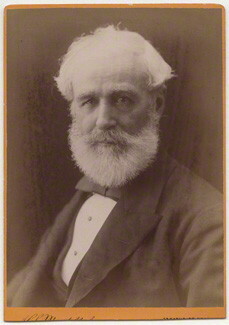 In 1849, Robert Rawlinson visited Birmingham to assess the public health of the town. Rawlinson was one of the first inspectors employed by the government under the Public Health Act of the same year. Whilst in Birmingham, Rawlinson received reports from local doctors and listened to complaints about substandard housing conditions and the limitations of the fresh water supply. The resultant report would ultimately lead to the amalgamation of Birmingham’s many administrative bodies under a single authority of the town council. The report, available to view at the Local Studies Centre, Library of Birmingham, is comprehensive and includes details of the town’s geographic features and a brief history before revealing some of the serious public health issues facing the local community. Public health had not really been a great national issue before the 1842 publication of Edwin Chadwick’s ‘The Sanitary Condition of the Labouring Population in Great Britain’. Below is an extract from the Report showing the information that local doctors provided in response to a request from Rawlinson. For the purpose of the investigation, the town was divided into districts and local doctors appointed to report on each. Birmingham was, perhaps rightly, proud of its successful deflection of ‘King Cholera’ during the devastating outbreaks in the 1830s. However, as the report below reveals, this shouldn’t be taken to mean that Birmingham was any healthier than other industrial centres at that time. Many of the outbreaks were attributed to poor sanitation and lack of fresh water. The majority of Birmingham’s houses had been built in the early part of the nineteenth century, generally without any sort of planning control. As a result, they quickly deteriorated and became unfit for purpose. In August 1848, there were 5 or 6 cases of typhus in Court No. 3, Sheepcote Street, resulting in several deaths. Diarrhoea – Steelhouse Lane almshouses, Lancaster St., Staniforth St., Slaney St., Snow Hill, Weaman St., Loveday St., Princess St., Price St., Whittall St., Shadwell St., and Balloon (sic) St.
Scarlet Fever – Lench St., Lancaster St.
No epidemics reported, but ‘scattered cases’ of typhus, measles, scarlet fever and hooping-cough (sic) at Old Inkley’s, New Inkley’s, Myrtle Row, Green’s Village, Tonk St. and Hill St.
‘There has been no disease in my district since the 1st November last, of either an epidemic or endemic nature’ – Mr Sproston suggests this was surprising given ‘locality and class of people living in it, consisting as it does of the low Irish, whose habits generally are of the most filthy kind’. He goes on to reveal that the district had ‘a very bad and insufficient supply of water’ with no water at all available in some parts and the sewerage and drainage ‘defective’. He expresses that an inspection of this part of town would be beneficial. The remarks on the local Irish community appear shocking to us today, but I have come across similar attitudes in other literature of the time, including Friedrich Engels Condition of the Working Class in England, written in 1844. Mr. Simons called attention to state of drainage in several courts on Duke Street and Sheep Street ‘in consequence of their being below the level of the streets in which there is no main sewer’. Suggests that many of the courts were covered with pools of water and ‘stagnated filth’ which in some parts was a foot deep ‘this all runs into a cistern from which it is pumped into a well as occasion may require’. Simons also states that, when visiting patients in Masshouse Lane, bricks had to be placed down to form an elevated footpath above the pools of water – again because of no drainage. He stated ‘the state of things unless removed may tend to produce fever and other contagious diseases’. For part of my thesis I’ve been finding out about some of Birmingham’s early 19th century administrators, the Street Commissioners. Last year I spent a wonderful summer in the Wolfson Centre at the Library of Birmingham, reading through fifty years of the commissioners’ minute books. This year I’ve spent a lot of time analysing the information from the notes and this has formed the basis of a chapter. One of the things I wanted to get across was that the body of commissioners were representatives of the local community and not some shadowy elites confined to the county seat over in Warwick. 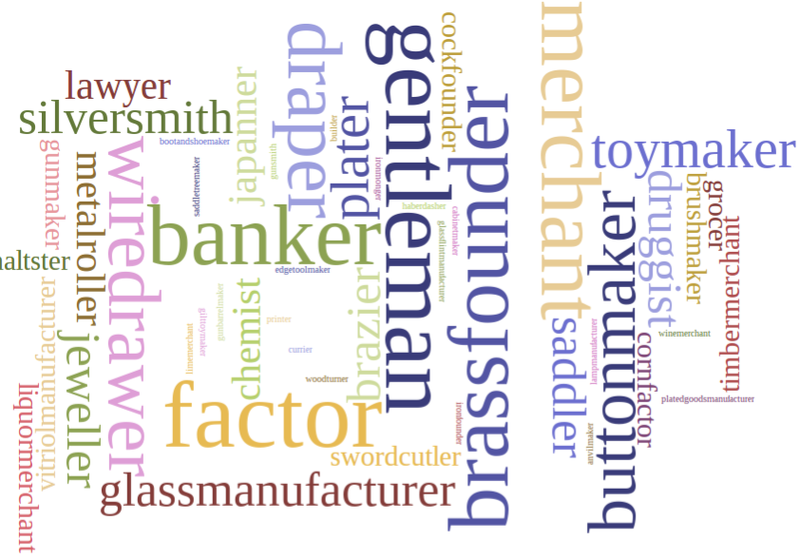 So, using my notes, I carried out a survey of commissioners’ occupations over the period 1812-1832. This proved quite time consuming work and I also discovered I’m not very good at counting! I ended up with a list of 255 street commissioners, who had held office during the time scale surveyed. I was able to find the occupation of most of them: sometimes the minute books included their occupation along with their place of business, sometimes it was only their place of business. Sometimes there was only a name. It looks as though July 2015 is going to bring something of a heatwave, with temperatures recorded on Wimbledon’s Centre Court reaching 40 degrees, while someone on the BBC labelled it ‘scorchio’. 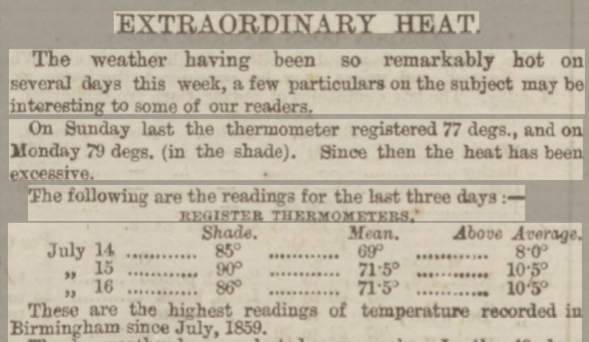 There were similar high temperatures in July, 1868, including at Wimbledon, although the sport was a rifle shooting tournament rather than tennis. 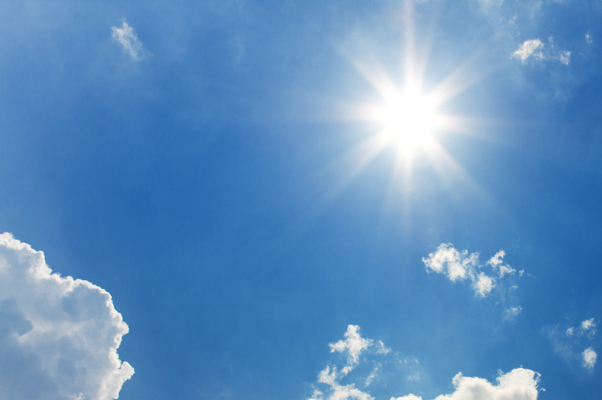 The Birmingham Daily Post stated that the weather, according to the thermometer, is something astounding’. The formality of uniform had been abandoned, the clothing is something astonishing – a pair of trousers, a flannel shirt and a straw hat constitute the luxuries of the day. At a weekly meeting of Birmingham’s ironmasters, the tropical heat of the weather was blamed for a shortage of iron arriving from the Staffordshire iron works, having made labour at the mills and furnaces for the time almost impossible. [Birmingham Daily Gazette, July 24th 1868] In London the cheese trade was also revealed to have suffered, and on July 31st an advert in the Coventry Herald declared that as soon as the temperature moderates we look for a fair enquiry for really prime cheese. Thank goodness that we now have access to cold beer and ice lollies! Keep cool and enjoy the sunshine! Birmingham’s nineteenth-century newspapers are available to read online by subscription to British Newspaper Archives, and FREE OF CHARGE at Library of Birmingham, Local Studies Centre, located on the fourth floor. Public libraries and archives are currently at risk as because of local government cuts; please support our local libraries and archives; lobby your MP, sign petitions, look out for protests. Once they’re gone, they’re gone!